Washington, DC — Over the past seven years, DCPS (DC Public Schools) stood as the epicenter of education reform. District residents have seen marked improvements. Chancellor Kaya Henderson’s Capital Commitment Campaign is in full swing and enrollment is steadily climbing. Most recently, Henderson with the mayor’s full support, announced the Empowering Men of Color initiative aimed at serving the population that has experienced the least amount of success, historically, in our school system. This is not only a strong statement acknowledging the District’s need to support Black and Latino men (in the same fashion they have every other subgroup in the city), it tells every household of color that their presence and existence is valuable and necessary to the foundation and diverse culture the city has grown to become. Ironically, DCPS has a major challenge: How to achieve the goals of the Empowering Young Males of Color initiative without having a solid and significant cohort of strong Black male educators? Research shows that there is a strong link between the lack of male educators of color and the academic and behavioral performance of male students of color. According to the U.S. Department of Education’s National Center for Education Statistics, 1.7 percent of the nation’s 4.8 million public school teachers are Black men. The majority of Black boys never have the opportunity to be taught by someone who looks like them or to experience an African American male role model in their classrooms. Recently, the Albert Shanker Institute, a research think tank, endowed by the American Federation of Teachers released a report stating that they saw a drop in the number of Black teachers in nine cities including Washington, DC. According to the report, the largest drop of Black teachers took place in the district between 2003 and 2011. The percentage of White teachers more than doubled from 16 percent to 39 percent. Black teachers in the district dwindled from 77 percent to 49 percent. A 28 percent decrease in the number of Black teachers in a system that has over 67 percent Black students. While DCPS and other school districts around the country fail to recruit, retain, and develop Black male teachers, DCPS also has another serious challenge: retaining and developing Black male administrators, which includes principals and district level leaders. Over the past 24 months, as the principal of the historic Paul Laurence Dunbar High School, I have watched more than two dozen competent and capable African American male principals and central office supervisors leave DCPS under the current leadership. They include: 16 principals, 2 instructional superintendents, and 10 central office directors, managers and specialists. Unfortunately, most of the principals were replaced with White or Black females. A few were replaced with a Black male principal or an assistant principal that were already in the system. In addition, two Black male instructional superintendents were replaced with a Black female and a White male. Black male administrators are disappearing in school districts like DCPS at extremely high rates. The “great White hope” syndrome has taken over urban school districts across the country, sending a message that male educators of color are not needed to properly educate and lead young men of color. New York City, Newark, New Orleans and other urban centers across the country are strong examples of this diseased phenomena in which Black male educators are disappearing and becoming invisible. The question is: Does DCPS leadership believe that it is necessary or particularly beneficial for children of color to be taught or led by educators of color? ‘If “Black lives matter,” how can the district successfully lead and turnaround urban school systems when Black men are absent and invisible? The glaring lack of cultural competency at the executive level has taken over urban school districts across the country. Interestingly, there are no Black male educators in senior leadership on the DCPS Executive team- including Dr. Robert Simmons, Chief of Innovation and the leader of the EMOC initiative, the most recent district office leader of color to disappear. What is DCPS’s issue with retaining and developing Black male leadership? In speaking with nearly all of the principals, instructional superintendents and department heads who left DCPS, a vast majority have cited a lack of respect for their opinion. They shared their personal experiences of being pushed out or encouraged to seek employment elsewhere; others were terminated. Most of them left on their own accord. All expressed frustration and a lack of support from DCPS’s District level leadership. Each shared similar stories regarding the lack of interest from central office staff in supporting the truly effective practices to drive student support. 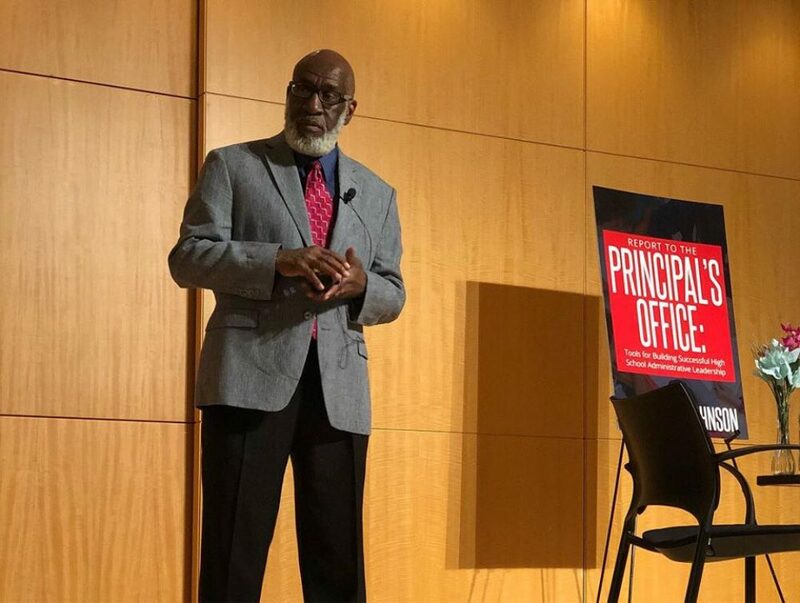 Many Black principals reported being told that they are “going off the reservation” by district leaders when they strongly advocated for the schools they led. This was often given as a thinly veiled threat to the principal that their job was in jeopardy when they brought up issues around staffing, autonomy, equitable funding or even school readiness for August openings. I recall in one of our Principal Leadership Academy meetings where Chancellor Henderson was excited about the new initiatives she had planned for the school year. In a most enthused and animated speech she told a room full of principals, “I charged my executive team to ramp it up. I challenged them to build a DCPS that they would send their children to!” Then she asked her leadership team to stand up; that’s when it hit me, there was not one Black male educator on her leadership team. As a matter of fact, there was not one person of color standing. On Saturday, October 10, 2015, the 20th reunion of the Million Man March took place right here in Washington DC. Mayor Muriel Bowser, Reverend Willie Wilson, DC Councilman Vincent Orange and others gave powerful speeches that supported the million men on the mall. Additionally, Minister Farrakhan spoke about the importance of education and the role that Black men play in educating our children. It’s hard to ignore what is taking place in the District of Columbia with regard to Black male educators. The lack of diversity in DCPS and other urban school districts has become a pervasive issue that few want to acknowledge or attempt to address. It has turned out to be the “elephant in the room” with regard to school improvement and turnaround efforts. There seems to be very little support for and confidence in the Black male educator. He is not valued nor seen as an asset. He is not given a platform or a voice to affect young men of color on a large scale. He is often overlooked and undermined. His greatest advantage is often used against him. In many cases, it’s the reason why he isn’t considered the “chosen one” when it comes to educating Black boys. The fact that he is an educator of color disqualifies him from being a part of the movement to empower young men of color. The irony is that the annihilation of the Black male educator is happening right here in Washington, DC. This is a major challenge that DCPS leadership must address. I implore DCPS to realize that losing African American teachers and administrators furthers cripples and marginalizes young Black men. Every effort must be made to hire, retain and develop Black men in school and district level leadership positions. We cannot empower them if we don’t hire them.